A routine of weight loss exercise can help to keep your weight under control. If you talk to many people today, nearly all have an interest in weight loss. More than half of the people in the world today weigh more than they should. Why? Because of eating without exercising. Overweight people definitely would want to reduce. Those okay with how they weigh would want to maintain and very few want to increase. Whatever your goals are, exercising is a major component that you need not to undermine. You cannot eliminate exercise from weight management, unless you want to go the shorter and easy way of using quick control pill- but remember these will have advanced negative effects on your health. So my advice is that you go the natural way- eat well and exercise! Am sure you took time and effort to gain weight; likewise, you will take time and effort to lose it. I guarantee you that dieting and exercise will give you the best results! Do you know that excess body fat is a threat to your health? Yet many people seen to be okay with having these excess fats. I will say that excess fat is not something to be tolerated and you should not be okay when you have them. Excess body fats have a connection with heart disease, and other chronic health conditions. Many occupation in our modern days do not involve much physical activity. We spend a lot of time sitting in the office. Our leisure times involve inactive activities like watching movies and football. Recent studies have proven that today there are many obese people that there has ever been. Fats levels in youths and children is going up and you now find many obese children and youths out there. The dangers of this trend is that if a child becomes obese, it is likely that the child will remain obese even even later in life. Regular weight loss exercise has been linked to reduce body fat. A routine of regular exercises is key to every weight loss program. Exercising will help to control both your fat levels and how heavy you weigh. To perform an easy fat test, pinch the fat fold at your abdomen and waist. 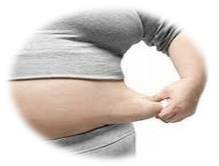 When you pinch one inch of fat or more- without including any muscle- then this is a sign of excess body fats. Regular weight loss exercise increases body lean mass and decreases the overall body fat levels. Due to this principle, you might find that you are not loosing because your muscles weigh more. However, a combination of proper diet and exercises will help you lose both your kilos and body fat. Always remember that our body need few quantities of body fat. Any excess fat is dangerous for your health and well being. Even though many types of exercises require energy, aerobics are known to use a lot of energy. Aerobics utilizes the large muscle groups in a rhythmic, sustained and continuous movement. These muscles require oxygen to produce energy. When oxygen is combined with stored fat, this produces energy which eventually powers the body musculature. These include brisk walking, biking, dancing, jogging and swimming among others. Lengthy aerobic movements require more energy and thus large amounts of calories are used. A routine of aerobics will benefit you with cardiac-respiratory endurance. This is the capability of your lungs, heart, blood vessels and tissues to utilize oxygen so as to produce the necessary energy needed by the body. Aerobic exercise will help in eliminating excess fats. Also supplement aerobics with stretching and muscle exercises. The more your muscles become strong, the longer you will exercise with less injury. Also known as resistance training, strength building increases the proportion of your body muscles. A good example is weight lifting. Many people still have the impression that strength is necessary only for highly trained athletes, fitness enthusiasts, and individuals who hold jobs that require heavy muscular work. On the contrary, a well planned strength training program leads to increased muscle strength and endurance, muscle tone, tendon and ligament strength, and bone density- all of which help to improve functional physical capacity. Experts recommend that for you to see and feel any change, you need to exercise for at least 30 minutes for 4 times in a week. If you find that this goal is too high to begin with, start with fewer minutes and increase gradually as your body adapts these exercises. Progress gradually till you are able to work out continuously for 30 to 40 minutes. If your goal is to lose a lot of pounds, then you need to work out your weight loss exercise for five times every week. Increase your work out minutes per exercise as well. Always work out vigorously to cause an increase in your breathing and heart rate; this will ensure that you are burning as much calories as possible. Combine different aerobic exercises every day, combine those that you love doing and those that you don't. This will keep you going without getting fed up with one particular exercise. Lastly, avoid skipping too many days without workouts as this might make you loose the benefits of exercise. It will also keep you out of control track. If you have to skip some days, ensure that you gradually work out back to your normal routine. Our bodies are naturally designed to be active. But the modern lifestyle makes everything so convenient at the expense of our valuable health. So if you have been sitting on your office for all your working hours, it’s time to fight back! Use the stairs instead of elevators; park far from your office and walk to the office; take lunch away from your office, etc. All these changes will ensure you remain active. Healthy weight loss help- This site is dedicated to help you discover real solutions to achieve amazing weight loss. Our solutions are all natural and easy. You will feel terrific and it works!